Here's a commercial that shows how it's played. I had one of these bad-boys back in the 60s. It was fun to play. I think you can find 'em on ebay. Its funny seeing this. I have two and they're sitting about two feet behind me at the moment. Yes, I'm a packrat (not quite a hoarder yet). I was playing with Dean Snyder and Dennis Jensen back in the '60s when the game was new. I perceived that Dennis was cheating so I picked up the hammer and threw it at him. I didn't mean to hit him in the eye. Anyway, I stormed out of Dean's house. I think one of the biggest curses in life is a long memory. Sorry, Dennis. 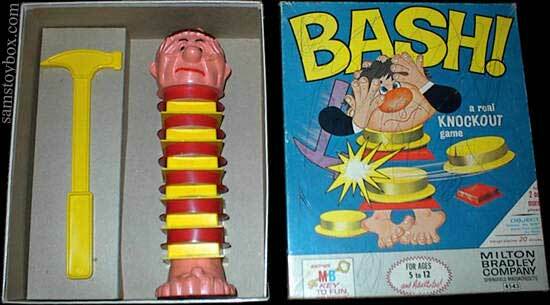 The TV commercial went "Bash,Bash,Bash.....brand new Milton-Bradley Game" to a tune.